The M in the movie's title is in the devnagri script with a hope to make it a symbol of Manjunath's sacrifice and a symbol for change. It has also launched a public platform on an exclusive microsite www.whoismanjunath.com. The poster of movie Manjunath - Idiot Tha Saala. 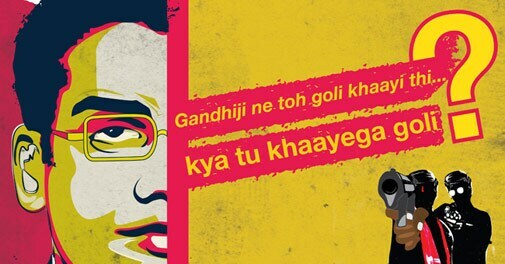 Manjunath - Idiot Tha Saala, a biopic on the IIM (Lucknow) graduate Manjunath Shanmugham who was brutally murdered in 2005 for standing up for what he believed was right, was released on Friday (May 9) across 150 to 200 screens in 18 to 20 cities and towns. It is being supported by student communities like those from the IITs and IIMs, besides corporate India. A low-budget film, Manjunath was made on less than Rs 5 crore excluding the marketing budget, and has been co-produced by National Film Development Corporation and director Sandeep A. Varma's advertising agency ICOMO (Integrated Communications and Media Operations). It is presented by Viacom 18 Motion Pictures. The list of corporate houses supporting the movie, whose protagonist was killed for standing up to the oil mafia in Lakhimpur Kheri, Uttar Pradesh, include the Jagran Group, the Tata Group, Arvind Brands (Arrow shirts), Yatra.com, ICICI Lombard, Landmark and Westside (Trent), ING Vysya Bank and Infosys. There will be a special screening fully sponsored by the IIM alumni association in Singapore on May 10 followed by a talk by director Varma. There are more such requests from other alumni who are overseas and are interested in watching this movie. Viacom 18 Motion Pictures has chosen to adopt a minimalistic but high-impact strategy to connect with a specific target audience, the youth. The M in the movie's title is in the devnagri script with a hope to make it a symbol of Manjunath's sacrifice and a symbol for change. It has also launched a public platform on an exclusive microsite www.whoismanjunath.com. This platform is targeted to garner support for other whistle-blowers and encourage the youth to "Speak-up" and stand for what is right. Director Varma spent four years researching the subject by talking to Manjunath's family, friends, professors at IIM, Lucknow, petroleum dealers and his colleagues at Indian Oil Corporation where he had joined as a marketing manager (grade A officer). He had no money when he started the movie. Many producers had rejected his script. Then, NFDC's script committee accepted the script and co-produced the movie with director Varma's agency, ICOMO that makes feature films, ad films and corporate films. Varma had initially 60 days to arrange the rest of the money which he got extended to 90 days as he was unable to put the money together. "I did not even have Rs 200,000 in my bank account when I started the movie. I've borrowed money from my friends, Manjunath's friends, among others, to make a start. Even non-resident Indians (NRIs) have supported the movie; for instance, an NRI was in India for some work, heard about the script, signed a cheque worth Rs 2,000,000 and went back. This donor has just asked me once or twice about how the movie was progressing then." But Varma does not want to brand it as crowdfunding, a trend that is picking up in India where filmmakers are able to fund their script-rich movies by donations through social media, majorly. He says strangers, who even have donated as little as Rs 2,000 to Rs 3,000, wanted such a movie to be made, and they expressed no sign of getting their returns on investment. NFDC has always supported films that tell compelling stories and Manjunath is one such story, says Vikramjit Roy, General Manager, Executive Producer and Head of Marketing at NFDC. "The film deals with real issues that impact the society and lends a voice to an unsung hero who rose in extraordinary circumstances. We hope that the film will resonate with the youth who are conscientious and do not hesitate to stand up for what is right. At NFDC, we are continuously seeking to create an environment conducive to the making of cinema that reflects diverse realities of contemporary India," says Roy. Rudrarup Dutta, Vice President, Marketing, Viacom18 Motion Pictures echoes NFDC's Roy's sentiment, and says it is one of those films that make you introspect. "As a studio, we stand committed to bringing to life the character of the formidable - Manjunath Shanmugam. He was definitely more than just an obscure news-headline." While ICOMO and NFDC have partnered to produce the film, Viacom18 Motion pictures is presenting the film. "The spirit of the film is more passion and inspiration than money," adds Dutta. The marketing of Manjunath - Idiot Tha Saala is being done by supporters who are passionate about the fight against corruption. For instance, a large chunk of it is being done by the student communities such as the Indian Institutes of Technology, Indian Institutes of Management and Faculty of Management Studies, Delhi (Varma is an alumnus of FMS). FMS students are spreading awareness across the Delhi University. The IIM community has collected Rs 30,00,000 to incentivize college students to watch this movie. It works like this. When a student books a ticket on movie ticket-booking website, bookmyshow.com, he/she gets a Rs 100 waiver on the purchased ticket against a gift voucher. A passionate fellow for Manjunath, the movie, is sponsoring tickets at a theatre in Lucknow to film buffs because he wants Manjunath's story against corruption to reach out. As Manjunath himself was the singer in his band at IIM Lucknow, Varma has paid attention to such small details and Delhi-based rock and roll music band Parikrama-who has done the background score and the music-has performed the songs in multiple cities with an active engagement with their fans to spread the message across as part of promotional activities. Once the movie recovers the investment, it won't be paying back its stake-holders. Varma details what the plan is. Viacom18 has decided to dedicate any profits that the film makes to the cause of fighting corruption. "We hope that the film will do well at the box office as that would mean that Manju's sacrifice has managed to inspire more people to stand up for what they believe in," Dutta of Viacom adds. Varma says profits, if the movie does well, will be re-invested in making more such movies that face trouble arranging the funding. "There will be a 12-part series for television consumption on 12 such real heroes and their untold stories, which will keep the audience engaged for a longer time," says Varma.